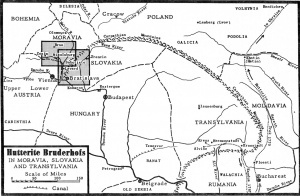 Map 1: Hutterite Bruderhofs in Moravia, Slovakia & Transylvania. Source: Mennonite Encyclopedia, v. 2, p. 858. The Hutterian Brethren, also called Hutterites, the Austrian branch of the great Anabaptist movement of the 16th century, was characterized by the practice of community of goods, as first established in Moravia in 1529 and re-established on more solid grounds by Jakob Hutter in 1533. In contradistinction to the other Anabaptist groups the Hutterites had the unique chance to develop their communal life in comparatively peaceful Moravia where, due to a predominantly Slavic surrounding, they lived in relative isolation from the rest of the world. Thus a rich group life developed with a strong sense for their own history. Remarkable is also their extensive manuscript literature (devotional and historical) which made it possible that their teachings and their history, particularly of the beginnings, should become better known than those of any other group of the Anabaptist movement except the Dutch. The 1520s saw a lively spread of Anabaptism throughout the Hapsburg territories, Tyrol, Austria, Carinthia, etc. In Tyrol in particular Anabaptism was by far the strongest trend, and remained so until far into the second half of the 16th century, in spite of a government which ruthlessly fought all "heretics" wherever they could be ferreted out. It was here that Georg Blaurock of Switzerland worked successfully as a missioner until his early martyrdom in 1529. Persecutions were extremely bloody. One source (Kirchmaier, 487) claimed that prior to 1530 no less than one thousand had been executed, and that the stakes were burning all along the Inn Valley. Yet the number of Anabaptists only grew. Soon the news became known that Moravia (and in particular the manorial estate Nikolsburg of the lords of Liechtenstein) was a haven for all sectarians. Here Hubmaier could freely write and print his new ideas concerning adult baptism. In fact, one of the Liechtensteins himself accepted baptism upon faith. Also other manorial lords showed sympathy and toleration, perhaps due to the fact that this country had seen the Hussites (now called Piccards) for nearly a century, and allowed complete freedom of conscience to practically all sorts of beliefs. Naturally from then on a continuous stream of Anabaptists moved toward this "promised land," from Tyrol as well as from other Hapsburg lands, but also from South Germany, Bavaria, Württemberg, Hesse, and even from Switzerland. 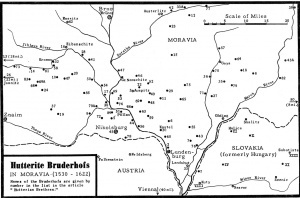 Map 2: Hutterite Bruderhofs in Moravia, 1530-1622. Other groups of evangelical Anabaptists in Moravia who did not accept community of goods were given the general name "Swiss Brethren," even though they did not come from Switzerland. Also a small group of followers of Pilgram Marpeck were found in Southern Moravia under the leadership of Leopold Scharnschlager. Yet these groups later disappeared, while the Hutterian Brethren managed to maintain themselves through all early hardships and local persecutions. 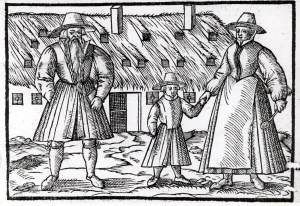 Hutterite family as illustrated in Erhard's 1588 Historia. This may have been due to a large extent to a remarkable number of outstanding leaders: Ulrich Stadler of Tyrol, Hans Amon of Bavaria, Peter Riedemann of Silesia, Peter Walpot of Tyrol, Klaus Braidl of Hesse, not to mention the long array of other brethren, most of whom died as martyrs or suffered long years of imprisonment. Although "expelled" from Moravia more than once upon mandates by Ferdinand (the later emperor), they yet somehow succeeded in finding the sympathy of the manorial lords, who quickly recognized their value as craftsmen and tillers of the soil. Many of these lords were either Protestants or at least in sympathy with the Reformation, and proud of their quasi-independence from the government in Vienna. And thus Moravia remained the one stable place in this century of intolerance and suffering. In 1546 the Brethren also moved east across the border into adjacent Slovakia (then a part of Hungary) where the influence of the Hapsburgs was still weaker, and where a good many of the lords belonged to the Reformed faith. Jakob Hutter was a leader for only two years (1533-1535); he returned to Tyrol where eventually he too fell into the hands of his persecutors. In February 1536 he was martyred. Hans Amon thereupon became the Vorsteher or head bishop of the brotherhood, 1536-1542, being a strong and inspiring leader. In this time organized missionary activities of the brethren set in, perhaps the first such in all of Europe. Missioners (Sendboten) were sent out to many places (knowing quite well the fate ahead of them; 80 per cent of them died a martyr's death), and those in the throes of death were comforted by epistles and visiting brethren (e.g., the case of the 140 Falkenstein Brethren who were sent to Trieste to become galley slaves, 1539-1540). One of the strongest missioners of this time was Peter Riedemann, who went more than once to Upper Austria and to Hesse. While in jail in Hesse (1540-1542), he drew up that outstanding document which from now on became the very symbolic book of the brotherhood, the Account of Our Religion (Rechenschaft) 1540 (printed 1565, and again in the 19th and 20th century). In 1542-1556 he shared the leadership of the brotherhood with Leonhard Lanzenstiel or Seiler. While elsewhere persecution intensified (Anabaptism had died out by the middle of the 16th century in the Hapsburg domain except Tyrol; it declined in Bavaria and other German lands), in Moravia on the contrary it experienced now a kind of flowering. This was particularly true during the reign of Emperor Maximilian II (1564-1576), himself rather in sympathy with Protestantism, hence averse to any harsh measures. The Brethren speak of the "Good Period" (about 1554-1565) and of the "Golden Period" (1565-1590 or 95). Although the Jesuits had been admitted in Hapsburg territories since about 1550-1560, they did not find full influence in Moravia until the end of the century. It is true that Nikolsburg had changed hands; the Dietrichsteins bought it in 1575, but even though they were more in sympathy with the Counter-Reformation, the Brethren could still persist here, too, relatively peacefully, until the coming of the Cardinal Franz von Dietrichstein in 1599, the very head of the Catholic party. During the Golden Period the Brethren, now well established all over southern Moravia and Slovakia, found a particularly strong leader in Peter Walpot, a Tyrolean, who led the group in 1565-1578, and whose activities added much to further consolidate the brotherhood. A number of regulations were drawn up, both for the general conduct of the brotherhood and for the different crafts or trades. The schools of the Brethren were organized on better defined grounds. Doctrinal and polemic writings (mostly anonymous) were drawn up (such as the great Article Book, the Handbüchlein, the book called Anschlag und Fürwenden, etc.). A rich correspondence with missionaries all over the countries of German tongue came in and went out (carefully recorded in a Schreibstube or scriptorium); the great Geschicht-Buch was then begun by Kaspar Braitmichel on the basis of archival material collected almost from the very beginning. In short, it was the peak of Hutterite history. It has been estimated that in Moravia and Slovakia together there existed at that time about one hundred Bruderhofs or farm colonies, with a population estimated at between 20,000 and 30,000. (Certain estimates go as high as 70,000, but that figure is most unlikely.) (See the accompanying maps.) While Anabaptism elsewhere (except for the Netherlands and Prussia) was on a sharp decline, in fact nearly disappeared as an articulated movement in the latter half of the 16th century, in remote Moravia and Slovakia it was almost on its way to becoming a distinct denomination (were it not that the sect-principle, that is, brotherhood-living, continued to be dominant). Very remarkable of that time were also contacts with the antitrinitarian Polish Brethren (Socinians) who in Racov (Poland) tried to set up their "New Jerusalem" (see Antitrinitarianism), somewhat along lines which they had been studying at the Moravian Hutterite communistic colonies. Visitors and correspondence witness to this contact which, however, never became very warm, due to basic differences both in doctrine and intellectual background. Contacts with Swiss Brethren, in Switzerland and elsewhere, continued to be intensive; missioners were sent out and a good number of Brethren from Switzerland and South Germany joined the church in Moravia. (The later bishop Ulrich Jausling, serving 1619-1621, had been such a Swiss newcomer.) Of particular interest was here a long letter (almost a tract) which the Vorsteher Klaus Braidl sent to a Swiss brother Christian Raussenberger in 1601 defending on Biblical ground the principle of community of goods. Also with the Prussian Mennonites around Elbing and Danzig contacts were obtained around the turn of the century. Even a settlement was attempted in Elbing though without success. In the meantime the peaceful period had come to an end, and severe trials were in store. (a) The Counter-Reformation became now the cry of the day. Whoever would not be converted to the Roman Church was to leave Moravia. Cardinal Franz von Dietrichstein gave the lead in that movement, supported by a most vigilant government in Vienna and two priests, Christoph Erhard and Christoph Andreas Fischer, in southern Moravia, who supplied the Catholics with polemic material (gross slanders), and cast suspicions of all kinds. They incited the hatred of the poor peasant population all around who naturally could not compete with large-scale rational farm economies (see Eysvogel and Jedelshauser). In short the situation became ever more precarious. Yet until 1622 they somehow managed to come through, although on a declining scale, (b) Turkish wars and invasions added to these internal troubles. Emperor Rudolph II asked for war contributions, and Dietrichstein was to extort them from the Brethren (at one time no less than 20,000 fl. was asked). Needless to say, the Brethren very decidedly declined, accepting all the consequences. In 1605 Turks and their Hungarian allies plundered southern Moravia and many brethren were killed or dragged away into Turkish captivity (see Böger). Eventually (c) the event, later called the Thirty Years' War, 1618-1648, brought the Moravian establishments of the Brethren to a complete end. After the success of the Catholic forces at the White Mountain in 1620, all restraint was dropped; complete expulsion was ordered by Vienna. The Geschicht-Buch (570-571) reported that what they lost in inventory (corn, wine, cattle, linen and woolens, groceries, equipment, and furniture) amounted to about 364,000 florins not assessing any houses and grounds. And all this after only one year earlier (1621) a sum of 30,000 fl. had been taken away from the Brethren by methods of extortion and downright robbery. 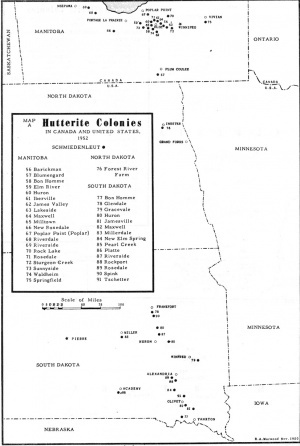 Map 5: Hutterite Colonies in Manitoba & the Dakotas, 1950s. 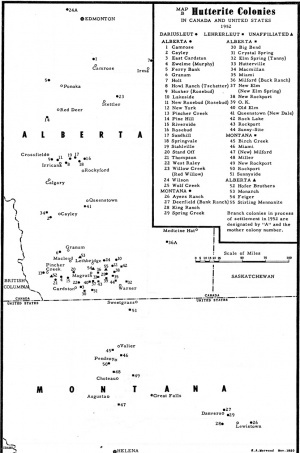 Map 6: Hutterite Colonies in Alberta & Montana, 1950s. With these events the brotherhood begins to show a sharp decline in activities and also in loyalty to the old principles, and even in number of members and colonies (in Slovakia there were only 15 colonies). 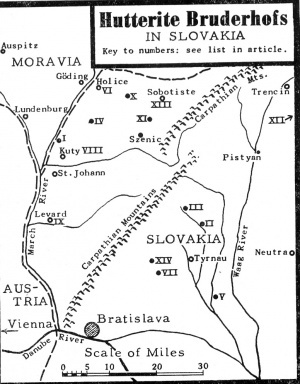 Although Moravia was now lost, the Brethren could still withdraw to their Slovakian colonies, and after 1621 also to their new Bruderhof in Alvinc, Transylvania (today Rumania). In spite of continued great hardships, mainly through Turkish marauders, the Brethren carried on, and visitors were amazed by their industriousness and diligence (see Grimmelshausen). The brotherhood was fortunate enough in getting once more a bishop of outstanding qualities in leadership and spirituality, viz., Andreas Ehrenpreis, 1639-1662, the real leader already since 1630. He was born in a Moravian colony. His work was an effort to revive the brotherhood in many regards: the last mission work in Silesia (contacts with Schwenkfeldians) and Danzig (the Socinians were contacted) was carried out, although with rather moderate success. A short-lived colony was established in Mannheim in 1664. Internal discipline was re-established by strict regulations (see Gemeindeordnungen). And a rich literature was produced. Of particular value for posterity was also the new custom of writing down all sermons (called Lehr und Vorred). The amount of such manuscript material is amazing; there were about 250 such Lehren (some quite voluminous books about most books of the New Testament, and many of the Old Testament, mainly prophets, psalms, also about many apocryphal books and pseudepigrapha), and about as many Vorreden (shorter sermons). The Klein-Geschichtsbueh (204-221) brought excerpts from these sermons. One may safely say that the Hutterian Brethren of the mid-20th century continued the Ehrenpreis tradition at least as much if not more than any earlier tradition (e.g., that of Jakob Hutter). Ehrenpreis' Gemeinde Ordnung of 1651 was still in use, and the sermons of that period were the backbone of all spiritual life of the brethren in the 20th century. After Ehrenpreis' death more tribulations made life in community of goods harder and harder until this core element of the Hutterites was partly abandoned, and a semiprivate or semicooperative form of economy was accepted (1685, 1695). The great misery of Turkish invasions with its looting (which the nonviolent Brethren could not stop in any way) impoverished the brotherhood to such an extent that they had to turn to their Dutch Mennonite "cousins" to ask for financial help. The Great Chronicle ends with the letter which Johann Riecker, the successor of Ehrenpreis, wrote to the "Gemeinden in Holland," 20 April 1665. It is known that the Doopsgezinde most generously responded (Inv. Arch. Amst. II, 419, a letter of thanks). Yet also this help could not prevent further troubles. After the defeat of the Turks before Vienna (1683) and their expulsion from Hungary (1700), the Hapsburg government gained strength also in this newly conquered territory. And even though the 18th century was known as one of religious toleration, it was not the same for Hungary. Empress Maria Theresa (1740-1780) allowed the otherwise forbidden Jesuits to exert all means to convert non-Catholics back to the Roman Church. And what torture, dungeon, and executioners could not achieve in the 16th century, the Jesuits achieved, at least partly, in the 18th, mainly in Slovakia. Their old manuscript books were confiscated (1757-1763, 1782-1784); children were taken away from their parents; and the more important male members were put into monasteries until they either accepted instructions and were converted, or until they died. Catholic services were established at the Bruderhofs and every one was compelled to attend. In short, externally the Hutterite population now turned Catholic, although in secret they continued to practice their old beliefs, likewise maintaining their cooperative enterprises. From then on the nickname Habaner became the general name for these people. In Transylvania the Brethren had dwindled to scarcely more than a small group of perhaps 30 or 40 souls. Then Lutheran transmigrants from Carinthia to Transylvania (they arrived in 1756) came into contact with this remnant of Hutterite life, and felt immediately attracted by this form of Christian communism. They now joined the brotherhood, and thus brought about a rejuvenation of and rededication to the old principles. Naturally, persecutions, mainly by Jesuits, quickly set in here too. After a number of attempts to find other places the Brethren finally decided to flee Transylvania (1767, after a stay of 146 years), across high mountain passes almost without trails, and to enter Walachia (now Romania) where conditions looked favorable. Another Turkish War (against Russia) again brought hardships, and the great trek continued after three years. 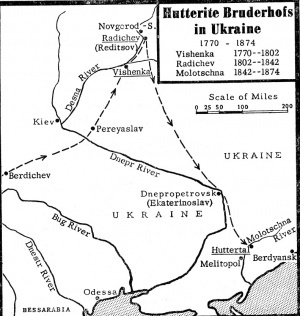 In 1770 at the Dniester River the Brethren were received by the Russian general Count Rumyantsev, who offered them an asylum on his own estate in the Ukraine (then a rather sparsely populated area). At Vyshenka the Brethren finally settled down for about one generation. In 1802 the colony was transferred to Czarist crown land at Radichev, 10 miles north. It was Johannes Waldner (born in Carinthia) who was then the most outstanding Vorsteher of the brotherhood (1794-1824). It was he who between 1793 and 1802 wrote the second big chronicle of the Hutterites, the Klein-Geschichtsbuch, a work of great charm and refinement. J. Loserth called Waldner a genuine historian. He was also a genuine disciple of Jakob Hutter, who with all his strength opposed the threatening abandonment of the principle of community of goods, which one group under the leadership of Jacob Walter (formerly of Slovakia) carried out in 1818. This new Walter-group then settled down in southern Russia (Molotschna district, under the sponsorship of the Mennonite Johann Cornies), where for about 40 years it practiced private property. In 1859-60 some leader dared to re-establish communal life as of old, and soon the new Hutterite villages began to thrive. Then in 1870, universal military conscription in Russia brought an end to all former privileges, and the Brethren saw no other way out than again to migrate -- in this case to immigrate to America. The story of this migration is too long to be retold here in detail. After a trip of inspection and scouting (1873), all the Brethren decided to come to the United States, where they chose the prairie land of South Dakota for settlement (in scenery so similar to the steppe of Russia). They arrived in 1874, 1877, and 1879, settling down in complete community of goods in three colonies near Yankton. According to these three settlements they are still today divided into the Darius-Leut (named after Darius Walter, their leader), Schmiede-Leut (after Michael Waldner, a blacksmith, their leader), and Lehrer-Leut (named after Jacob Wipf, called the Lehrer). The last group, when still in Russia, did not practice community of goods but began to do so in South Dakota. Those of their members who were disinclined, however, to accept this new-old form of living and wanted to stay in private ownership, later joined the group now called Krimmer Mennonite Brethren or also the General Conference Mennonites. The colonies soon grew again under the favorable conditions of American democracy and its freedom, until new suffering occurred during World War I. Then super-patriots could not understand the nonresistant attitude of these Anabaptists, and a great number of young Hutterite conscientious objectors went through almost unbelievable hardships in federal prisons. Two men died there on account of exposure and privations. At that point the Brethren decided to move on to Canada where exemption from military service was granted. They located in southern Alberta, and south central Manitoba. However, one colony, the original one at Bonhomme, remained in South Dakota, and several new ones have been re-established there, while others were established in north central Montana from Alberta. In 1930, Eberhard Arnold, who had founded a community in Germany, spent a year among the Hutterian colonies and joined his group with the older movement. Bruderhof Communities has maintained a relationship with the Hutterites since that time. In the 1950s the brotherhood was still growing, and in general their young people stayed loyal to their group. In 1954 they had close to 120 farm colonies (Bruderhofs) with almost 10,000 souls (between 50 and 150 souls per colony). Community of goods was practiced everywhere, rather strictly, and seemed to result in thrift and general health, both physical and moral. By and large the customs of old were observed, and this reminded the visitor occasionally of similar Amish attitudes. Although the young people learned English in their schools (on each Bruderhof), they yet spoke exclusively German at home. Since the days of Ehrenpreis (17th century), mission work was abandoned. At their services they read the sermons of old, and did not allow any new ones. The use of farm machinery, cars, telephone, and electric light was accepted, but otherwise they shared very little in modern American civilization. They continued to copy their manuscript books by hand (in fine penmanship). Only the two Chronicles and their hymnbook had been printed, together with Riedemann's Rechenschaft of 1540 and Ehrenpreis' great Sendbrief of 1652. This article cannot describe in any way the inner life of the Brethren or their external organization; for these purposes compare the following articles: Bruderhof, Community of goods, Ceramics, Folk Arts, Economic History of the Hutterian Brethren, Education — Hutterite, Epistles — Hutterite, as well as articles on leaders such as Hutter, Amon, Riedemann, Walpot, Braidl, Ehrenpreis, and on their books, Article Book, Chronicles, Handbüchlein, Rechenschaft, Liederbuch. Finally also the following articles should be consulted: Gemeindeordnungen, regarding their regulations and discipline, Marriage, Medicine among the Hutterites, dealing with their barber-surgeons and physicians, Sermons—Hutterite, and naturally also the article Habaner which gives details about those who had turned Catholic in the 18th century. (According to E. Crous, Mennonitisches Lexikon III, 420-422. (According to E. Crous, Mennonitisches Lexikon III, 423. Table 6: North Ameria, 1950, by branches (According to J. W. Eaton, "The Hutterite Mental Health Study," Mennonite Quarterly Review 25 (1951): 17-19. The colonies of the Society of Brothers (Paraguay, etc.) had grown in the same period to more than 1,000 souls. Note for the Maps: Rev. David Decker, Tschetter Colony, South Dakota, Rev. Paul Gross, Pincher Creek Colony, Alberta, Rev. Peter Hofer, James Valley Colony, Manitoba, Rev. Joseph Waldner, Springfield Colony, Manitoba, and Rev. John Würz, Wilson Colony, Alberta, assisted in preparing a list of Hutterite colonies and determining their location. The maps were prepared under the direction of Dr. Joseph W. Eaton, Dept. of Sociology and Anthropology, Wayne University, Detroit, Michigan, with the assistance of Evelyn Plaut; they were drawn by R. A. Morwood of the Dept. of Geography at Wayne University. The first exhaustive list of Hutterite Bruderhofs in Europe with locations (concerning Moravia and Slovakia, however) was that prepared by E. Crous and published in 1953 in connection with the article Rabenska in the Mennonitisches Lexikon (Installment 39, pp. 418-23) where two maps were also given, prepared by Dr. Gerhard Wöhlke of the Geographical Institute in Göttingen on the basis of the Austrian Spezialkarte 1:75,000, published 1869-1888 by the K. K. Militärgeographisches Institut. The Crous lists are here reproduced, but new maps were prepared by Dr. Robert Friedmann, two of which are based on the Mennonitisches Lexikon maps. The first two lists contained all known Bruderhofs of the 16th and 17th centuries, without indication as to the date of dissolution. They therefore do not reveal how many were in existence at any one time, although most were in existence in the "Golden Age" ca. 1590. The only such list is the third one, which names the Bruderhofs in existence in Moravia, 1619-1622, 1622 being the date when all were expelled from the country. J. Loserth published the first list of Bruderhofs in his Communismus (1894) p. 246. This list he published in Mennonitisches Lexikon (1931) Haushaben, slightly revised, where 88 locations are named. Fr. Hruby published a list of 43 Bruderhofs in existence in Moravia in 1619-1622, in his Wiedertäufer in Mähren (Leipzig, 1935), which is reproduced as list no. 3 above. He reported that a considerable number of Bruderhofs were destroyed in 1605. According to Hruby most of the Bruderhofs were in Czech nationality areas; only 9 of the 43 listed areas were in German nationality areas. The Hutterian Brethren practice community of goods, as first established in Moravia in 1529 and re-established by Jakob Hutter in 1533 according to the example of the first church in Jerusalem (Acts 2:44), "And all that believed were together, and had all things in common." The basic beliefs and way of life, including community of goods, are the same today as when the movement began. In 1990 there were about 353 Hutterite colonies with a population of more than 35,000. They were situated in British Columbia, Alberta, Saskatchewan, Manitoba, Washington, Montana, North Dakota, South Dakota, Minnesota, Pennsylvania, New York, Connecticut, England, and Japan. The Hutterians in Japan began as a small group of Japanese Christians in 1969. They had all things in common and in a worldwide search for other groups living according to the gospel and Acts 2 and 4, their leader, Izeki, visited the Hutterian Brethren. He was baptized at Wilson Siding Bruderhof in 1975 and confirmed as Servant of the Word two years later. The Hutterians who fled to the United States from Russia in the 1870s and moved to Canada after World War I because of hostility and mistreatment on account of their conscientious objection against military participation, encountered fresh discrimination following the outbreak of World War II and in subsequent years. The Hutterians refused to join any branch of the military forces, but accepted alternative service under civilian jurisdiction. In 1942 the Alberta legislature passed an act preventing the Hutterites from buying land if the site was closer than 40 miles (65 km) from an existing colony, and the amount of land was limited to not more than 6,400 acres (2600 hectares). In 1960 the law was amended. New colonies were formed in Montana in 1948 and in Saskatchewan in 1952. In Manitoba attempts were made to introduce restrictive legislation. Fearing restrictions like those in Alberta, a "gentleman's agreement" with the Union of Manitoba Municipalities stipulated the location of no more than one or two colonies per municipality and at least 10 miles (16 km) apart. In 1971 this agreement was terminated. The Schmiedeleut (Manitoba and Dakota colonies) set up their own mutual insurance in 1980. The other two groups do not insure, but depend upon intercolony mutual aid when a fire or disaster strikes. Sizable donations are given every year to local funds and to the disaster fund of the Mennonite Central Committee. The Dakota colonies formed a health or hospital insurance fund while the Canadian colonies participate in provincial health plans. Hutterian children attend kindergarten (age 2-5), and elementary school (age 6-16). Normally the colony supplies the building, heating, and the maintenance costs. The local school division and board selects and pays the salary of the teachers, administers the school and, in most cases, pays a small rent for the building. In the past 10 years a number of colonies which have experienced difficulties in acquiring teacher grants have educated their own members as qualified teachers. It is also felt that a colony's own teacher will offset the worldly influence of the outside teacher. In Manitoba the Hutterite English teachers formed an association which provides inservice training sessions geared to the colony teacher's needs. The children also receive two hours of German instruction daily from their own German teacher. The Dariusleut and Schmiedeleut have German school from October to May, while the Lehrerleut have it from September to June. Training sessions of two to three days per year for German teachers have been held for 10 years in Manitoba and South Dakota. Many of the teachers have replaced the Tyrolean dialect with the use of standard (high) German as the language of instruction. The Hutterite Education Committee, along with other German teachers, has developed a history course for use in English and German schools. Other materials and new books have been introduced on hymnology, grammar, literature, etc. Many schools have copying and printing machines. A bookstore at James Valley Bruderhof in Manitoba stocks most school and church materials as well as books in English and German. German schools in Manitoba colonies received sizable cultural grants from both federal and provincial governments for the retention of language, printing of cultural or historical books, and training sessions. Arnold, Eberhard. Inner Land: A Guide into the Heart and Soul of the Bible, 5 vols. Rifton, NY: Plough Publishing House, 1975. Arnold, Eberhard. God's Revolution: The Witness of Eberhard Arnold, ed. by the Hutterian Brethren and John Howard Yoder Ramsey, NJ: Paulist Press, 1984. Arnold, Eberhard. Salt and Light: Talks and Writings on the Sermon on the Mount, 3rd ed. Rifton, NY: Plough Publishing Co., 1986. Arnold, Eberhard. The Early Anabaptists. Rifton, NY: Plough 1984. Arnold, Eberhard, Emmy Arnold, Christoph Blumhardt, and Alfred Delp. When the Time was Fulfilled: On Advent and Christmas, introd. by Dwight Blough. Rifton, NY: Plough, 1965. Arnold, Eberhard and Emmy Arnold. Seeking for the Kingdom of God: Origins of the Bruderhof Communities. Rifton, NY: Plough, 1974. Arnold, Emmy. Torches Together: The Beginning and Early Years of the Bruderhof Communities, 2nd. ed. Rifton, NY: Plough, 1971. Arnold, Hardy, Hans Meier, Winifred Hildel, and others. "In Pursuit of Jesus: An Oral History of the Bruderhof." Sojourners 13 (May 1984): 16-20. Bennett, John W. Hutterian Brethren: The Agricultural Economy and Social Organization of a Communal People. Stanford U. Press, 1967. The Chronicle of the Hutterian Brethren [Große Geschichtbuch], trans. and ed. by the Hutterian Brethren/ Rifton, NY: Plough, 1987. Clark, Bertha W. "The Hutterian Communities." Journal of Political Economy (1924): 357-374, 468-486. Eaton, J. W. and R. T. Weil. Culture and Mental Disorder, a Comparative Study of the Hutterites. Glencoe, Ill, 1954. Eaton, J. W. and A. J. Mayer. Man's Capacity to Reproduce; the Demography of a Unique Population (Hutterites). Glencoe, Illinois, 1954. Eggers, Ulrich. Gemeinschaft-lebenslänglich: Deutsche Hutterer in den USA. Witten: Bundes Verlag 1985; English transl. Community for Life. Scottdale, PA: Herald Press, 1988. Ehrenpreis, Andreas and Claus Felbinger. Brotherly Community, the Highest Command of Love. Rifton, NY: Plough, 1978: two important Anabaptist documents of 1650 and 1560, with introd. by Robert Friedmann. Fischer, Hans. Jakob Hutter, Leben, Frömmigkeit und Briefe. Newton, KS, 1957. Friedmann, Robert. "Comprehensive Review of. Research on the Hutterites, 1880-1950." Mennonite Quarterly Review 24 (1950): 353-363. Friedmann, Robert. "Die Briefe der österreichischen Täufer." Archiv für Reformation-Geschichte 26 (1929): 30-80, 161-187, with extensive bibliography. Friedmann, Robert. "The Christian Communism of the Hutterian Brethren." Archiv für Reformation-Geschichte (1955). Friedmann, Robert. "Christian Love in Action, the Hutterites." Mennonite Life (July 1946): 38-43. Friedmann, Robert. "Economic Aspects of Early Hutterite Life." Mennonite Quarterly Review 30 (October 1956): 259-266. Friedmann, Robert, ed., Quellen zur Geschichte der Täufer, vol. 3: Glaubenszeugnisse oberdeutscher Taufgesinnter, vol. 2, Quellen und Forschungen zur Reformationsgeschichte 34 Gütersloh, 1967. Friedmann, Robert. "Hutterite Physicians and Barber-Surgeons." Mennonite Quarterly Review 27 (1953): 128-136. Friedmann, Robert. Hutterite Studies: Essays by Robert Friedmann, Collected and Published in Honor of His Seventieth Anniversary, ed. Harold S. Bender. Goshen, IN: Mennonite Historical Society, 1961. Friedmann, Robert. Die Schriften der Hutterischen Täufergemeinschaften: Gesamtkatalog ihrer Manuskriptbücher ihrer Schreiber und ihrer Literatur, 1529-1667. Vienna: Hermann Böhlaus Nachfolger, 1965. Friedmann, Robert. "Fifty Years Society of Brothers, (1920-1970): Their Story and their Books." Mennonite Life 25 (October 1970): 159-64. Gross, Leonard. The Golden Years of the Hutterites: The Witness and Thought of the Communal Moravian Anabaptists During the Walpot Era, 1565-1578. Scottdale, PA: Herald Press, 1980. Gross, Paul. The Hutterite Way: The Inside Story the Life, Customs, Religion and Traditions of Hutterites. Saskatoon, SK: Freeman Pub. Co., 1965. Hege, Christian and Christian Neff. Mennonitisches Lexikon, 4 vols. Frankfurt & Weierhof: Hege; Karlsruhe: Schneider, 1913-1967: v. II, 378-384. Heimaann, J. "The Hutterite Doctrines of Church and Common Life. A Study of Peter Riedemann's Confession of Faith." Mennonite Quarterly Review 26 (1952): 22-47, 142-160. Hofer, John. The History of the Hutterites. Elie, MB: The Hutterian Educational Committee, James Valley Bruderhof, 1982. Hofer, Joshua. Japanische Hutterer: Ein Besuch bei der Owa Gemeinde. Elie, MB: James Valley Book Centre, 1985. Hofer, Peter. The Hutterian Brethren and Their Beliefs. Starbuck, MB: The Hutterian Brethren of Manitoba, 1955. Holzach, Michael. Das Vergessene Volk: Ein Jahr bei den deutschen Hutterer in Kanada. Munich: Deutscher Taschenbuch Verlag, 1982. Hostetler, John A. Hutterite Life, 3rd ed. Scottdale, PA: Herald Press, 1983. Hostetler, John A. Hutterite Society. Baltimore: Johns Hopkins University Press, 1974. Hostetler, John A. Source Materials on the Hutterites in the Mennonite Encyclopedia. Edmonton, AB: U. of Alberta, 1962. Die Hutterischen Epistel: 1527 bis 1767, 3 vols. Elie, MB: Hutterischen Brüder in Amerika, James Valley Book Centre, 1986. Die Lieder der Hutterischen Brüder.... Scottdale, PA, 1914; reprints: Winnipeg, 1953; Cayley, AB, 1962. Horsch, John. The Hutterian Brethren. Goshen, IN, 1931. Hruby, Fr. Die Wiedertäufer in Mähren. Leipzig, 1935. Hutter, Jakob. Brotherly Faithfulness: Epistles from a Time of Persecution. Rifton, NY: Plough, 1979. Kleinsasser, Jacob, Hardy Arnold, Jakob Hofer and Daniel Moody. For the Sake of Divine Truth. Rifton, NY: Plough 1974, a report on a journey to Europe in the summer of 1974. Längin, Bernd. Die Hutterer: Gefangene der Vergangenheit, Pilger der Gegenwart, Propheten der Zukunft. Hamburg und Zürich: Rasch and Roehring, 1986. Meier, Hans. "The Dissolution of the Rhön Bruderhof in Germany." Mennonite Historical Bulletin 41 (July 1980): 1-6. Mennonite World Handbook (MWH), ed. Paul N. Kraybill. Lombard, IL: Mennonite World Conference [MWC], 1978: 352-56. Mennonite World Handbook, Strasbourg, France, and Lombard, I:: MWC, 1984: 141. Mennonite World Handbook, ed. Diether Götz Lichdi. Carol Stream, IL: MWC, 1990: 413. Mow, Merrill. "Community Living in our Time. An Account of the Bruderhof Communities." Brethren Life and Thought 1, no. 5 (Autumn 1956): 43-52. Müller, Lydia. Der Kommunismus der mährischen Wiedertäufer. Leipzig, 1927. Müller, Lydia, ed. Quellen zur Geschichte der Täufer, vol. 3: Glaubenszeugnisse oberdeutscher Taufgesinnter, vol. 1, Quel­len und Forschungen zur Reformationsgeschichte, 20. Leipzig, 1938. Peters, Victor. All Things Common: The Hutterian Way of Life. Minneapolis: University of Minnesota Press, 1965. Riedemann, Peter. Account of Our Religion, Doctrine, and Faith, trans. Kathleen E. Hasenberg. London: Hodder and Stoughton, and Plough Publishing House, 1938, 1950, 1970. Sommer, J. "Hutterite Medicine and Physicians in Moravia in the 16th Century and After." Mennonite Quarterly Review 27 (1953): 111-127. Thomson, Barbara R. "The Challenge of True Brotherhood." Christianity Today (25 March 1985): 22-28. Waltner, Gary J. "The Educational System of the Hutterian Anabaptists and their Schulordnung of the 16th and 17th Centuries." MA thesis, History Dept., U. of South Dakota, 1975. Zieglschmid, A. J. F. Das Klein-Geschichtsbuch der Hutterischen Brüder. Philadelphia, PA: Carl Schurz Memorial Foundation, 1947. With exhaustive bibliography to that date. Friedmann, Robert, John Hofer, Hans Meier and John V. Hinde. "Hutterian Brethren (Hutterische Brüder)." Global Anabaptist Mennonite Encyclopedia Online. 1989. Web. 25 Apr 2019. http://gameo.org/index.php?title=Hutterian_Brethren_(Hutterische_Br%C3%BCder)&oldid=162606. Friedmann, Robert, John Hofer, Hans Meier and John V. Hinde. (1989). Hutterian Brethren (Hutterische Brüder). Global Anabaptist Mennonite Encyclopedia Online. Retrieved 25 April 2019, from http://gameo.org/index.php?title=Hutterian_Brethren_(Hutterische_Br%C3%BCder)&oldid=162606. Adapted by permission of Herald Press, Harrisonburg, Virginia, from Mennonite Encyclopedia, Vol. 2, pp. 854-865; vol. 5, pp. 406-409. All rights reserved. This page was last modified on 15 December 2018, at 12:45.